Eyebrows were initially raised when Marvel announced that Dan Slott would be penning an Untold Tales of Spider-Man-esque miniseries dubbed “Learning to Crawl,” that would look at some never before seen events that transpired around Amazing Fantasy #15 and Amazing Spider-Man #1-2. It’s only natural to be a bit concerned when one of the “big two” comic book publishers plans on updating elements of a more than 50-year-old superhero origin story, especially one that is as revered, and quite honestly, as perfect as Spider-Man’s. Still, I thought if anyone was capable of doing it (beyond Kurt Busiek, who’s work on Untold Tales in the 90s was just extraordinary), it would be Slott. I know Slott is one of those personalities who Spider-Man fans either love or loathe, but regardless of my own personal opinion of him, I have never questioned his sincerity as one of the biggest Spider-Man fans out there. Slott’s dialogue and ear for the highly dramatic (in a comic book kind of a way) just oozes reverence and inspiration for the great Stan Lee. Sure, Slott’s style sometimes leads to corny melodrama and plot holes, but so did Stan’s. Slott’s respect for the original Silver Age Lee/Steve Ditko source material is what ultimately makes the first issue of “Learning to Crawl,” (numbered Amazing Spider-Man #1.1 just to drive people like me insane), such a successful start. 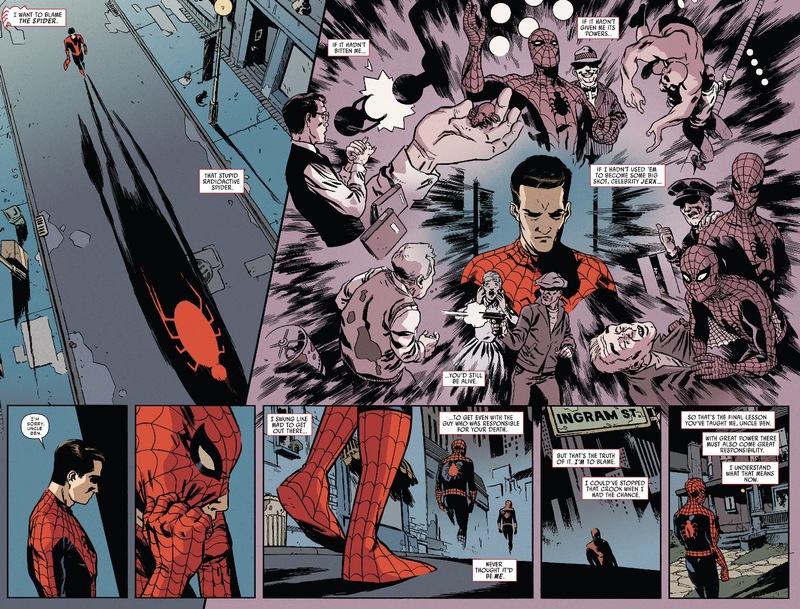 The comic opens with Peter moments after he discovers the identity of the burglar who murdered his Uncle Ben; the revelation that would haunt Peter for the rest of his life (to the tune of “with great power, must also come great responsibility”). Slott’s dialogue, not to mention the wonderfully vintage art from Ramon Perez, transplants the reader back to the “olden days” of Spider-Man without missing a beat. In fact, putting aside a few of the modern touches added by the creative team (since this is all supposed to take place 13 years ago, characters have cell phones, use computers, etc. ), if ASM #1.1 was put in front of me without any context or explanation, I would absolutely accept this story as being some kind of lost chapter or deleted scene from Lee and Ditko. If I had any complaints about this first issue, is that it’s almost too reverential. Despite the fact that I really enjoyed reading and looking at this comic book – both Slott and Perez really bring their “A” game to every page – I do find myself, ever so slightly, questioning the purpose of this series. 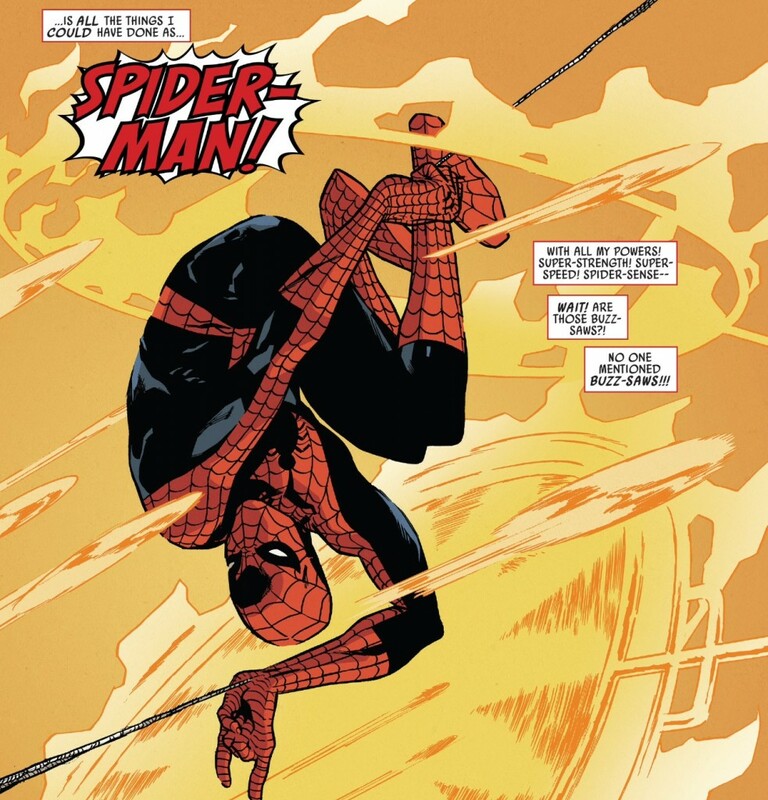 Slott is clearly treading carefully around Spider-Man’s origin story – for obvious reasons. But beyond introducing some additional context surrounding why Peter and his supporting cast are the way they are, there’s very little being put forward in ASM #1.1 that one should consider new ground. Extended scenes between Spider-Man and his somewhat crooked agent Maxie are fun, but I can’t say extra content related to that relationship is something I’ve been clamoring for since I first read the Lee/Ditko run umpteen years ago. 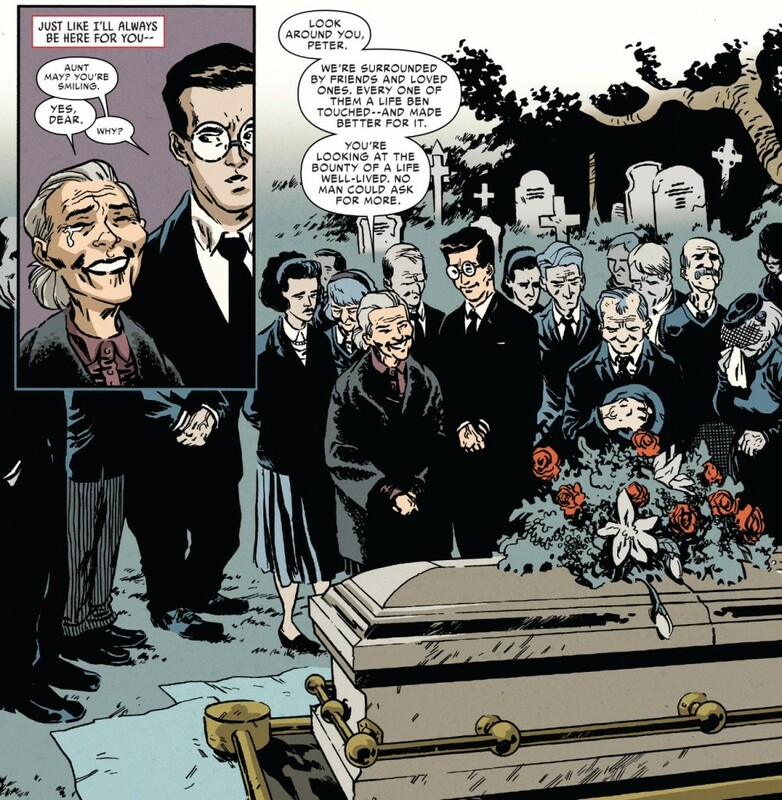 Watching Peter make funeral arrangements (and receive lots of casseroles) for Uncle Ben only adds to the character’s relateability and the tragedy he inadvertently caused for he and his Aunt May. But again, was anyone out there demanding a comic book series that would go into this level of detail about Spider-Man’s personal life? I’m not trying to sound ungrateful here, because really enjoyed this first issue. I’m just waiting to figure out what the eventual hook is going to be for this series. Slott, as a writer and creator, very rarely puts forward something so subtle and nuanced. I’ve been on the record on multiple occasions saying I actually prefer it when Slott goes the subtle route, because sometimes his grand, operatic ideas have a tendency to collapse under their own weight (i.e. “Goblin Nation” or “Ends of the Earth”). So what’s going to be the big game changing moment in all of this? Or maybe that’s the biggest shock of … that there is no shock. 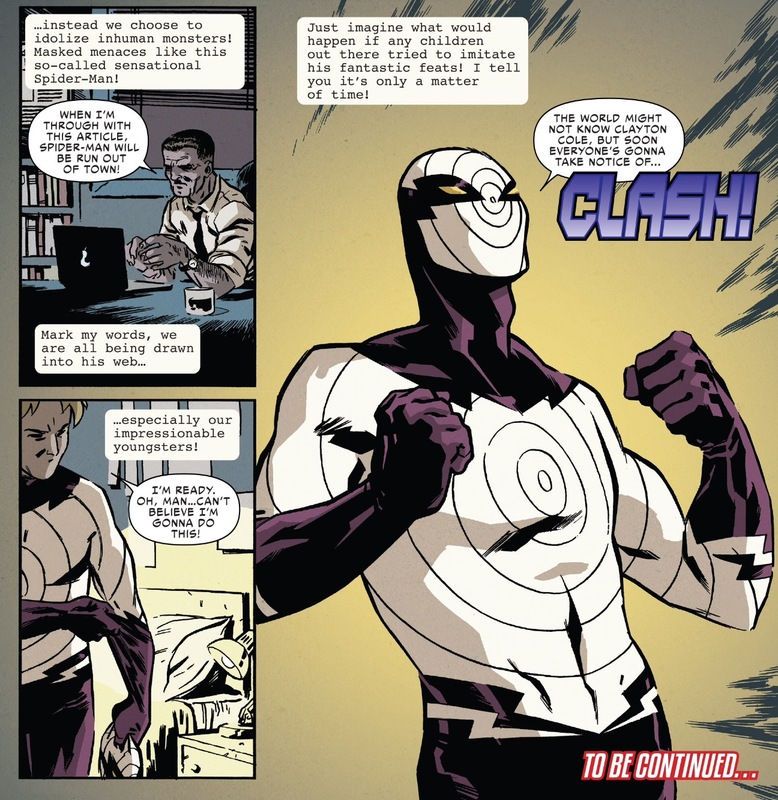 There’s undoubtedly potential for something wild and different with the creation of the Clayton/Clash character. The premise of another teenager out there as either an ally or antagonist for Spider-Man was something Slott talked about when “Learning to Crawl” was first floated by Marvel earlier this year. I suspect that through the rise and likely fall of Clayton and “Clash,” that Spider-Man/Peter will develop a firmer understanding of what that famous (often misquoted) adage of power and responsibility is all about. It is no coincidence that J. Jonah Jameson’s editorial about Spider-Man’s potentially negative influence on the city’s children (as opposed to “real” heroes like his astronaut son John), that we see Clayton’s obsession with Spidey grow to the point that he now feels that becoming a superhero himself is an appropriate decision. Clayton’s fixation on Spidey is akin to what many teenagers experience with the Beatles in the 1960s. And while it is always great to be loved, any documentary about the Beatles will feature interviews that speak to the uneasiness and anxiety that is born from such ardent, possibly unbalanced fanaticism. In kind, Peter’s self-inflicted guilt is arguably his most defining characteristic, so I can only imagine how responsible he will feel if Clayton gets hurt or killed trying to be a “hero” like Spider-Man. That should put power and responsibility in a whole new light for Spidey. But right now, my ruminations about Clayton and how his path will inevitably intersect Peter’s is just that – speculation. 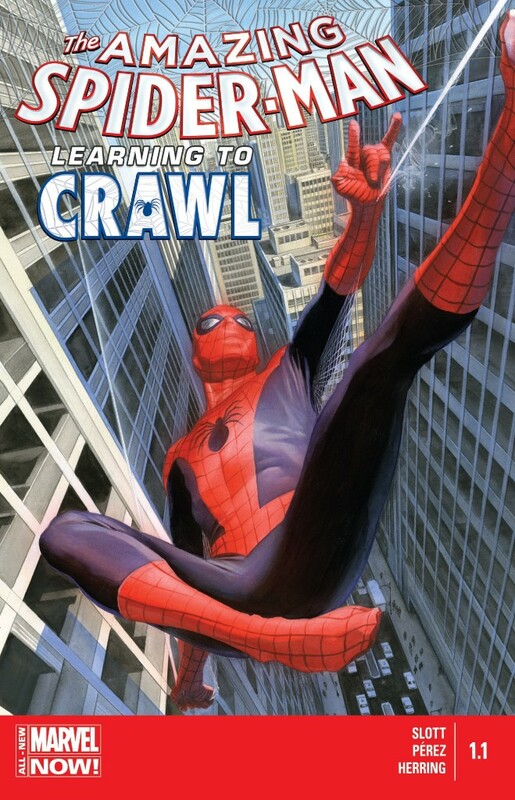 If that’s the direction Slott takes “Learning to Crawl,” then I think there is a lot of potential there for this series to be both nostalgic and respectful, while also traversing new terrain – or at least going over the same old terrain, but in a way that provides some additional wrinkles. Nothing can be too modern or contemporary in comic books. These books will stand the test of time, thanks to Slott’s genius plotting of this updated origin. There’s no doubt Marvel will collect this in trade and offer it for years to come in their digital download service. As such something taken 13 years ago which in our current time as 2001-2002 where there is no macbook or thin laptop computers, texting wasnt a thing and neither was the iphone and all are referenced here or in the backup of ASM #1. 13 years from now when some new generation reads this tale possibly as their first comic book, everything will make sense and seem right for the times. Slott just engineered a great approach for an origin that won’t seem dated immediately after publication. If the story holds up it could be a definitive origin or lost tale for years to come. It was like reading Stan Lee and Steve Ditko’s Spider-Man written with the characterisation and pacing approach of Bendis and Bagley’s Ultimate Spider-Man. As a fan of both, this is an incredibly winning and effective combination.